Hot water gets in the cold water line without running the pump. Problems with the spring loaded check valve are exceedingly rare but on occasion an adjustment may be necessary to compensate for unusual plumbing layouts or exceptionally high-flow cold water uses. The adjustment is quick, easy, and effective. As can be seen from the exploded view below in Fig 1, the valve is very simple. 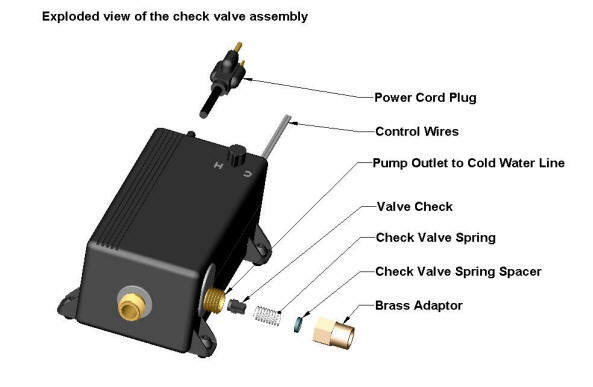 A rubber valve check is held against the opening in the pumping chamber that opens into the outlet tube by a spring. The spring (and spacer if used) is held in by the brass fitting. The hole through the check valve is larger than the outlet of the pump housing. If a particle of something can make it through the 1/8 inch dia. outlet hole in the pumping chamber, then it is way too small to get stuck in the check valve, it will just flow on out. Maintenance Free – No build up of mineral deposits or sediment with a demand system pump! Traditional circulating pumps are typically and historically used to pump hot water for extended periods of time. Long term flow of hot water through pipes causes mineral deposits to build up, and they can break loose clogging pumps and valves. The Chilipepper is different! The Chilipepper shuts off on a rise in temperature, and won’t pump at all if the temperature is over 96 degrees. When hot water is used at the tap, the hot water does not flow through the Chilipepper pump. It bypasses the pump and goes straight to the fixture. Since there is never an extended period of hot water circulating through the pump, there is no reason for it or the valve to clog. There is no periodic maintenance or cleaning required. Just install it and forget it. There are two possibilities for hot water leaking into the cold water line, and both are easily corrected. The first is if dirt or debris block the spring loaded valve check from closing completely, allowing hot or cold water and bleed in either direction. This is a very rare problem as the water passages are large enough that the valve is self cleaning. However, if you wish to clean the check valve, it is easily done. Remove the brass fitting on the side outlet of the pump. Pull out the spring, valve check, and if there is one, the spacer. Wipe off the face of the rubber valve check with a cloth or sponge. Look down into the outlet tube and check for any debris. Remove any debris with a Q-tip or something similar. Even a twisted up paper towel. If it looks clean it is clean enough. Put the valve check, spring, and spacer if need back into the outlet tube. Thread the brass fitting onto the outlet tube and don’t over tighten it. It seals with a washer. Do not use Teflon tape. Be sure to purge the air from the pump before starting by running the hot and cold faucets for a few moments. Hot water gets into the cold water line when cold water is used. In rare cases with some plumbing layouts, a large flow of cold water can create enough of a pressure difference to open the check valve allowing some water flow through the pump from hot to cold. If you find hot water entering the cold water line during heavy flows of cold water, then you may need to increase the check valve spring force by placing one of the spacers included with each Chilipepper over the spring. See Fig 1 below. It could take as many as three spacers in some instances.